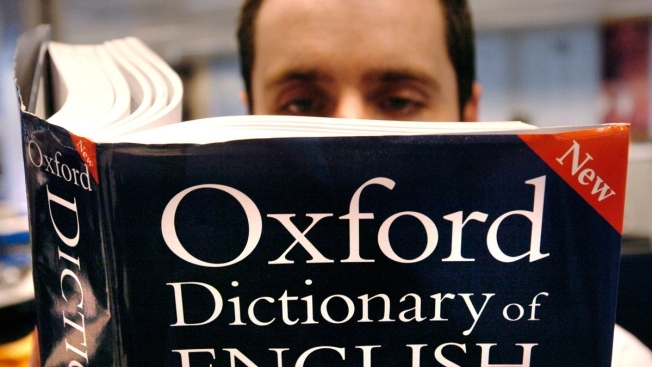 The British publisher said "toxic" was chosen over words like "techlash" and "gaslighting" thanks to the "sheer scope of its application"
FILE - In this March 14, 2007 file photo, a man reads a copy of the Oxford Dictionary of English. Previous words of the year include "youthquake" and "post-truth"
2018 has been a lot of things but one word seems to sum it up best: toxic. At least that's according to Oxford Dictionaries' official word of the year selection. The British publisher said "toxic" beat out other expressions including "techlash" and "gaslighting" thanks to the "sheer scope of its application." "In 2018, toxic added many strings to its poisoned bow becoming an intoxicating descriptor for the year's most talked about topics," Oxford Dictionaries said on its website late Wednesday. The dictionary defines "toxic" as "poisonous" with its roots derived from the medieval Latin term "toxicus," meaning poisoned or imbued with poison. Data from Oxford Dictionaries show a 45 percent increase in the number of times people have looked up the word on its website. "Our research shows that this year, more than ever, people have been using 'toxic' to describe a vast array of things, situations, concerns and events," a video released by Oxford Dictionaries on Twitter said. The video pointed to the use of the word toxic literally in describing chemicals and substances like plastics, as well as metaphorically depicting relationships and masculinity. It said the #MeToo movement "put the spotlight on toxic masculinity" while in politics the word has been applied to the "rhetoric, policies, agendas and legacies of leaders and governments around the globe." "Toxic" came ahead of "techlash," which Oxford Dictionaries defines as "a strong and widespread negative reaction to the growing power and influence of large technology companies, particularly those based in Silicon Valley." "Techlash" has been a key for theme companies like Facebook, Google and Amazon amid data privacy scandals and monopolistic concerns. Other contenders this year included "gaslighting," "incel," "overtourism" and "orbiting." Last year's word was "youthquake" while "post-truth" topped the list in 2016. Oxford Dictionaries' website said candidates for the word of the year are selected from the publisher's language research program, which gathers around 150 million words in the English language. It said the word or expression is "judged to reflect the ethos, mood, or preoccupations of the passing year, and have lasting potential as a term of cultural significance."